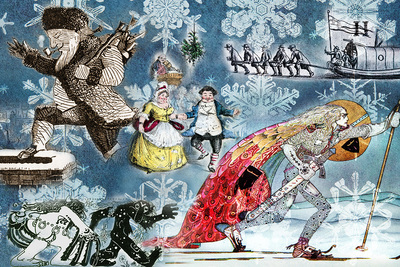 A composite of images from holiday- and winter-themed books at the Rare Book and Manuscript Library. CHAMPAIGN, Ill. — I’m at the Rare Book and Manuscript Library for its holiday open house, lured here by mulled cider and the opportunity to letterpress print a holiday card. But between the printing and the cider, I find what is for me the highlight of the open house – holiday- and winter-themed books on display. I am thrilled to find a book, “Snow Crystals,” by Wilson Bentley, known as “Snowflake” Bentley. 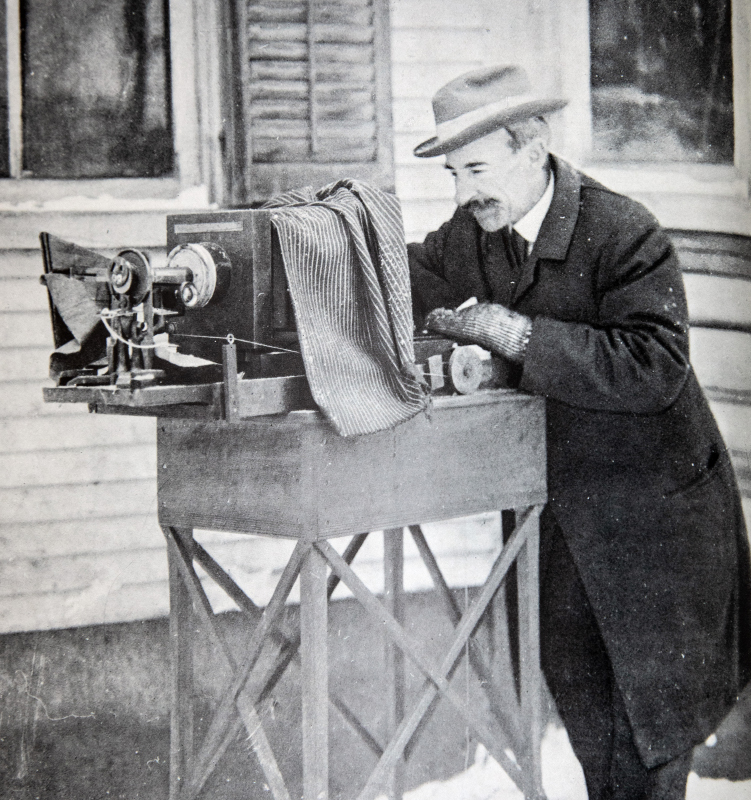 A native of Jericho, Vermont, he was the first person to photograph snowflakes. I’ve been to the museum in Jericho dedicated to his work, and I’m a big fan. 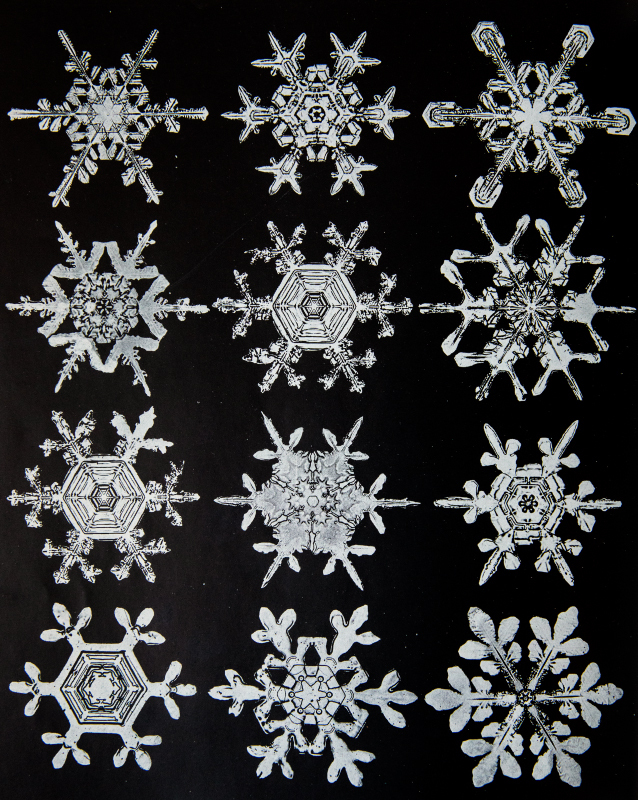 The 1931 book contains 2,500 photographs of snowflakes. Some are geometric in shape, and others feature delicate crystal branches. Bentley photographed snowflakes that would quickly melt from the warmth of a person’s breath or body heat. Bentley would catch snowflakes on a black board, move to a shelter out of the wind and in good light, and examine the snowflakes under a magnifying glass. If they were intact, he transferred them to a glass plate and photographed them with a photomicrographic camera – a microscope to which he attached a bellows camera. The exposure time averaged 20 seconds, depending on the brightness of the sky, according to the book. 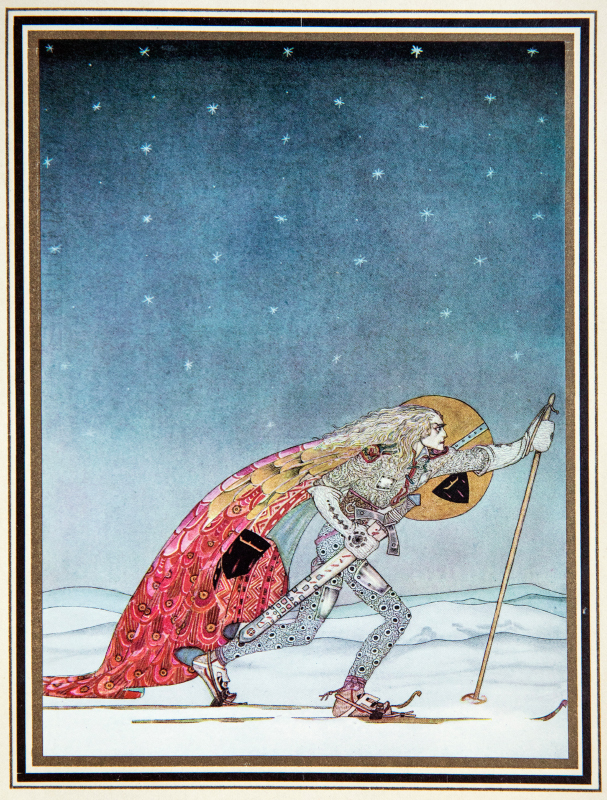 After paging through the snowflake images, I move on to examine the beautiful illustrations in a book of Norse folk tales. “East of the Sun, West of the Moon: Old Tales From the North” is a 1914 book of stories that originally appeared in “Popular Tales from the Norse,” translated in 1859 by G.W. Dasent. 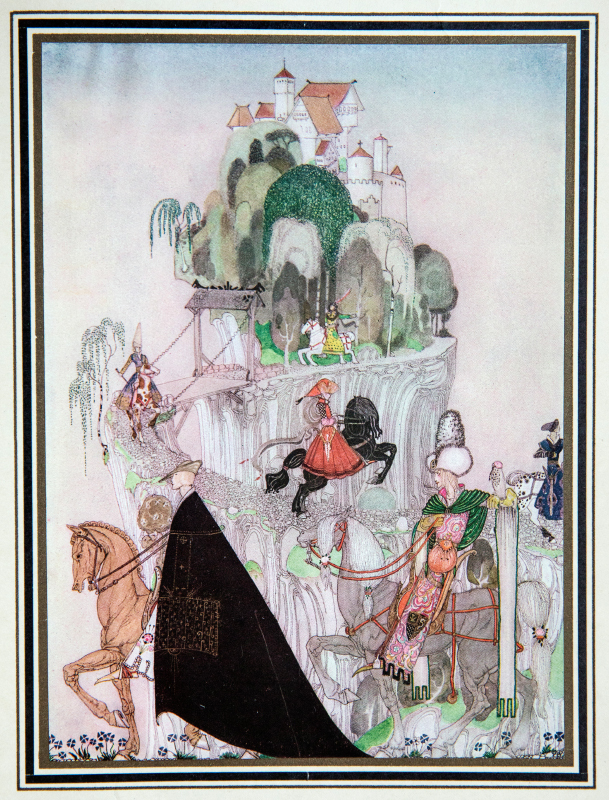 The illustrations by Kay Nielsen are incredibly detailed and colorful. My favorite is of a man gliding across snow on cross-country skis under a starry sky. He is carrying a sword and shield, and a red cape with a pattern resembling feathers trails behind him. This illustration is from the story “The Three Princesses of Whiteland,” which appears in “East of the Sun, West of the Moon: Old Tales From the North,” a book of Norse folk tales. This illustration is from the story “The Giant Who Had No Heart in His Body,” which appears in “East of the Sun, West of the Moon: Old Tales From the North,” a book of Norse folk tales. 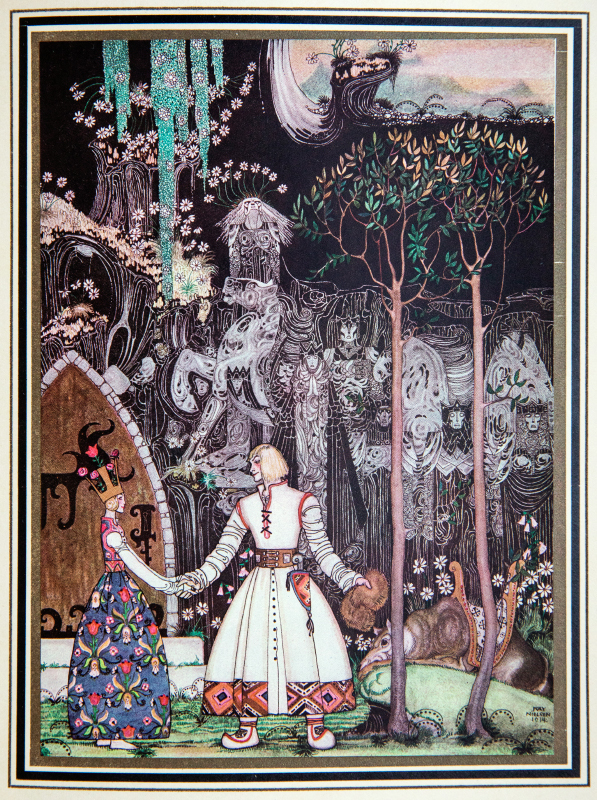 This illustration is from the story “Soria Moria Castle,” which appears in “East of the Sun, West of the Moon: Old Tales From the North,” a book of Norse folk tales. 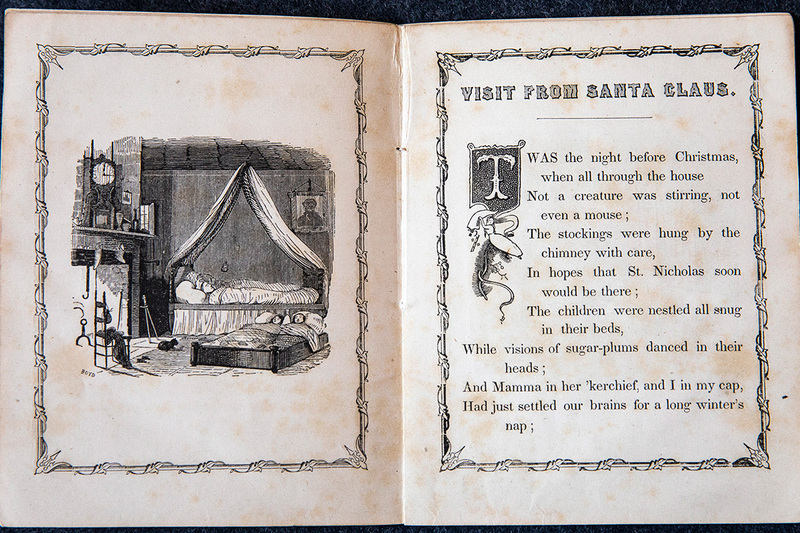 The other treasures on display include an 1848 pamphlet “A Visit From St. Nicholas,” featuring Clement C. Moore’s famous poem. It is illustrated with black-and-white drawings of an elflike Santa Claus on a rooftop and carrying a bag of toys. 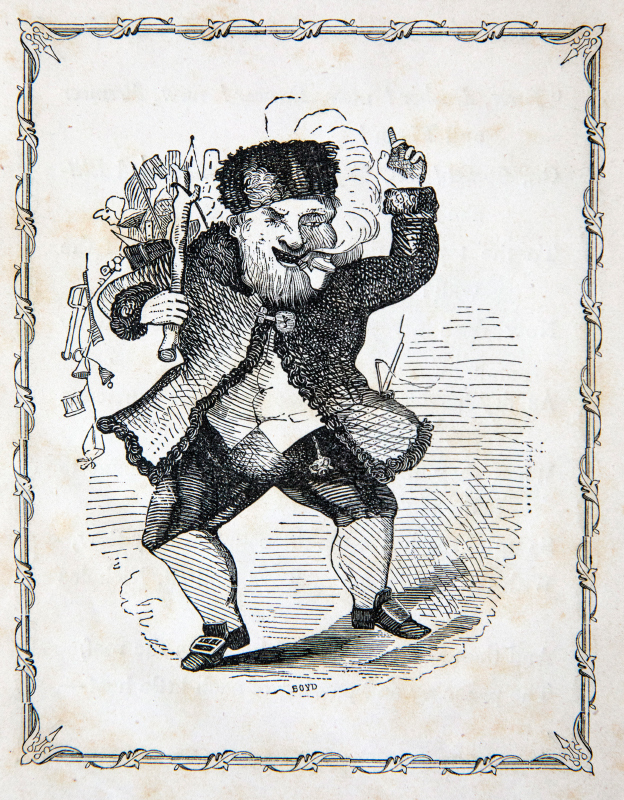 An 1848 printing of “A Visit From St. Nicholas” by Clement C. Moore. 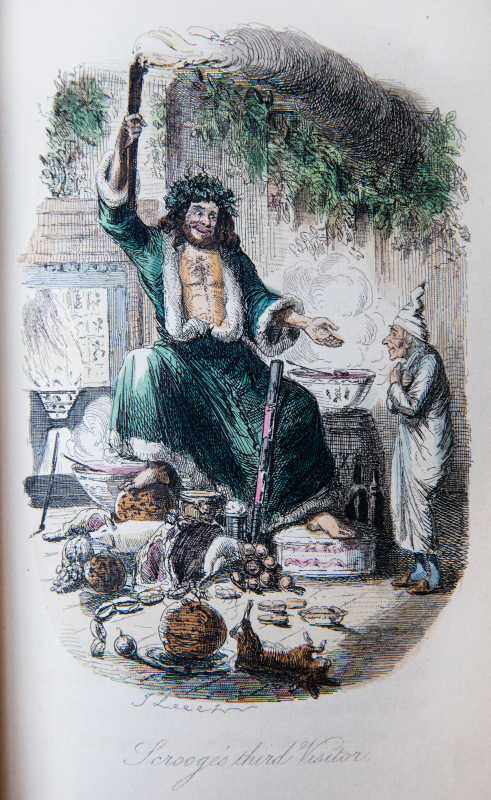 There is an 1843 edition of “A Christmas Carol” by Charles Dickens, with colorful illustrations. A 1928 book, “Christmas Tree” by e.e. cummings, has a three-dimensional quality. 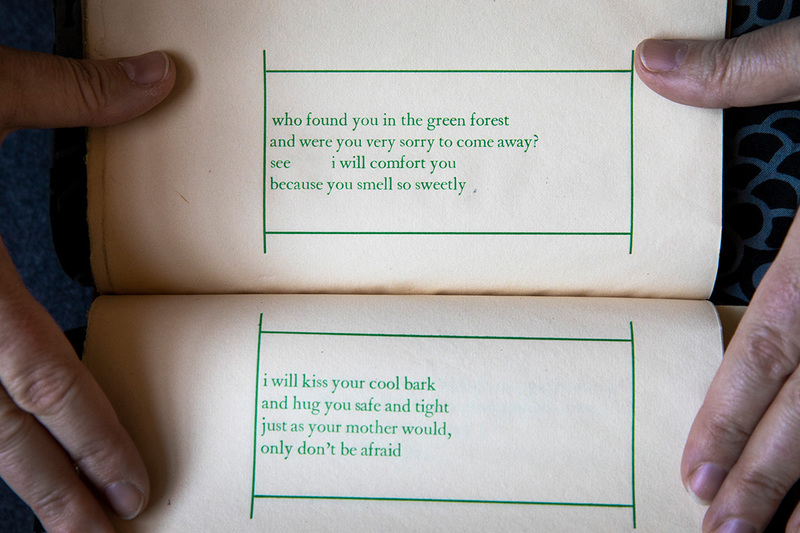 The poem’s words appear in green ink on sheets of paper folded to form the leaves of the book, with the words turned at a 90-degree angle. The title at the book’s front and information at the end are printed in a vertical shape that resembles a stylized tree. The poem “Christmas Tree” by e.e. cummings is printed at a 90-degree angle on the pages. 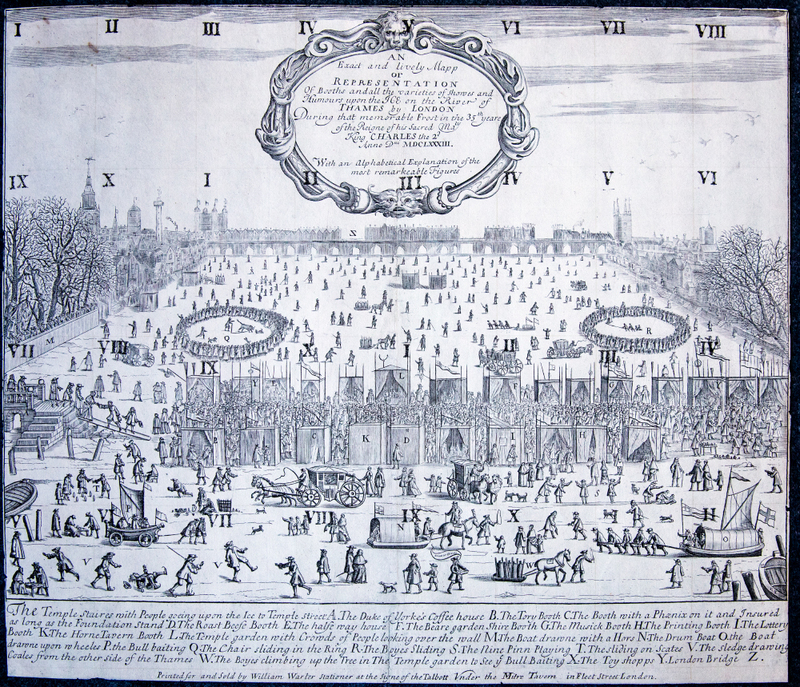 Finally, I look at an illustration from 1683 of a frost fair on the River Thames in London. The frozen river is filled with people. Children play games on the ice. Horses pull boats on wheels. A series of tents appear on the river in the foreground of the print, and an index describes what is seen in the illustration: a “Roast Beefe Booth,” a “Beare Garden Shire Booth” and various other booths for music, printing and lottery, as well as toy shops. London Bridge looms in the background. An illustration depicting a 1683 frost fair on the frozen River Thames in London. Roman numerals appear in regular intervals across the illustration. Curator Caroline Szylowicz tells me the illustration was meant to be cut up into playing cards for piquet, a popular game at the time. 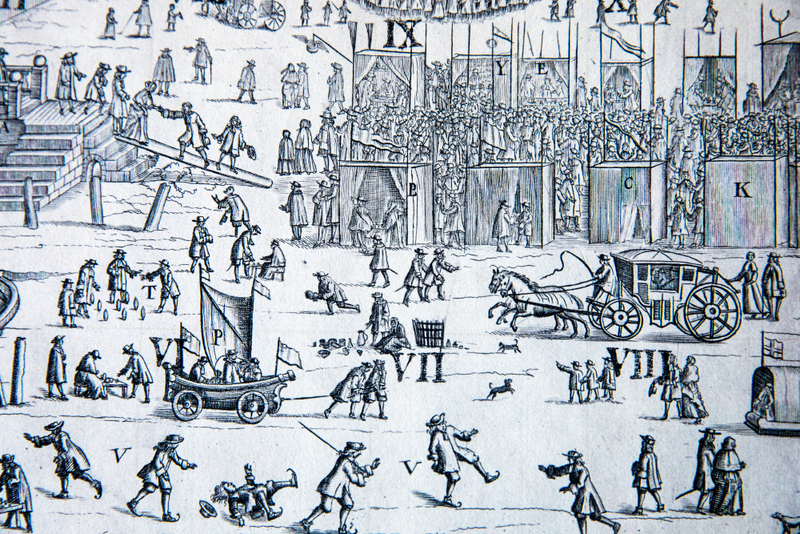 A close-up of a 1683 illustration of a frost fair on the frozen River Thames in London. “This was a very commercial object, trying to capitalize on the popularity of the frost fair,” Szylowicz says. These beautiful books and illustrations put me in a holiday mood. They are on display only during the open house, but visitors to the Rare Book and Manuscript Library, 1408 W. Gregory Drive, Urbana, can request to see them any time. The library is closed during winter break, Dec. 22-Jan. 1. It reopens Jan. 2. Editor’s note: Subscribe to Behind the Scenes for short blog posts, photos and videos from Illinois faculty, researchers, students and staff about their work and lives. Send an email with “SUBSCRIBE BTS” in the subject line.